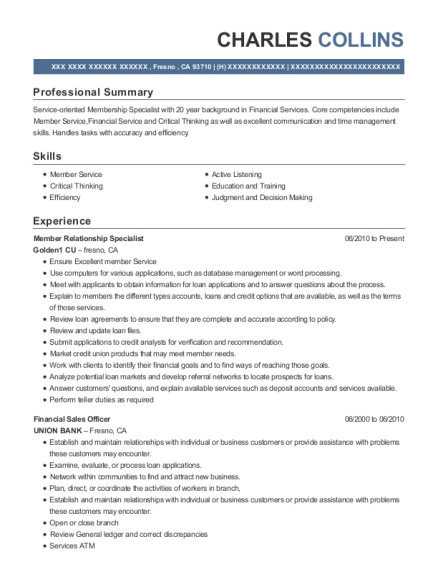 Service-oriented Member Relationship Specialist with eight year background in Banking/Sales and Service. Core competencies include hard working, quick learner, compliant and 10-key as well as excellent communication and time management skills. Handles tasks with accuracy and efficiency. Actively listen for clues to uncover hidden needs for members and suggest solutions. Profile member transactions while matching them against member's accounts. Accurately and efficiently processing member transactions. Organize all birthday celebrations, potlucks, in-branch events. Place and process all branch supply orders. Monitor and replace brochures based on revision dates. Utilize Excel and Microsoft Word to complete tasks. Input and process loan applications. Utilize multiple resources to track sales results. Assist with auditing and other operational tasks. Assist peers with locating outages and correcting processing errors. Handling and processing monetary transactions. Completing opening and closing duties. Providing tellers with check acceptance and withdrawal approvals. Proficiently utilizing Outlook to schedule appointments. Adhering to regulations and internal procedures to ensure compliance. Adhering to regulations and procedures to ensure compliance. Received multiple member compliment letters and E-Cards for internal recognition. Letters of recommendation will be provided upon request. 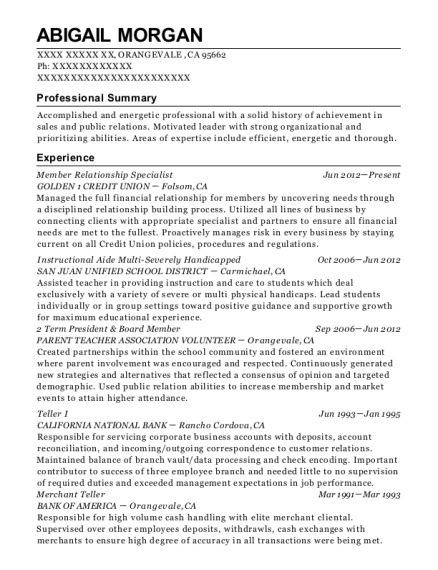 This is a resume for a Member Relationship Specialist in Elk Grove, California with experience working for such companies as Golden 1 Credit Union and Golden 1 Credit Union. 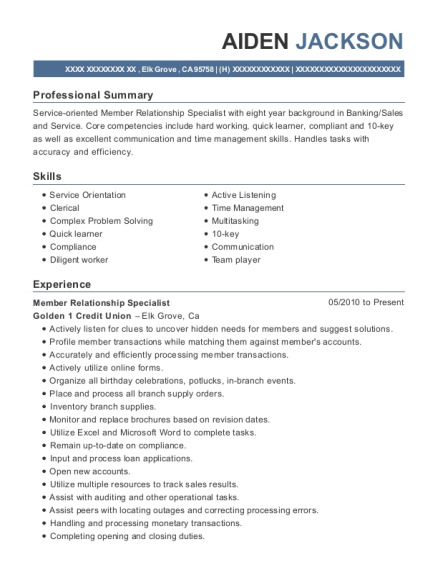 The grade for this resume is 0 and is one of hundreds of Member Relationship Specialist resumes available on our site for free. 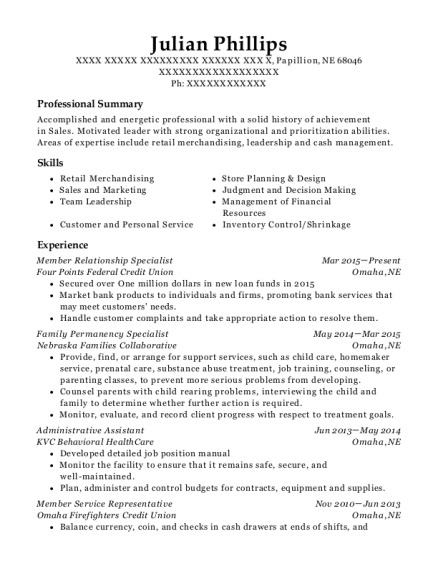 Use these resumes as templates to get help creating the best Member Relationship Specialist resume.